Customers have come from towns like Ridgefield, Westport, New Canaan, South Salem NY, Easton, Greenwich, Newton, Port Chester NY, and Trumbull to find the perfect fireplace insert for their home. 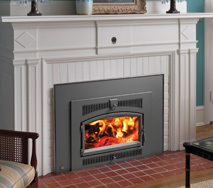 Serving communities throughout Fairfield, Westchester, and Litchfield County, our fireplace experts are here to help you through the process of purchasing a wood, pellet, or gas fireplace insert. While most of us enjoy the crackling sound of a fire blazing in the hearth, a traditional wood burning fireplace can lose 90% – 100% of the heat it generates up the chimney. This is bad news if you are hoping to reduce your heating bills by making more use of your fireplace. Luckily, a fireplace inserts can solve this problem. Fireplace inserts are designed to increase the energy efficiency of a traditional fireplace without diminishing its aesthetic appeal. These elegantly engineered heating appliances are installed in the firebox, or hearth, of masonry and factory built fireplaces. They allow the fire to burn more completely which increases their energy efficiency by 70% – 90%. Typically, they are made of heavy steel or cast iron with insulated glass doors in the front and decorative paneling for the sides. Along with improving the efficiency of your fireplace, you can choose your fuel of choice. 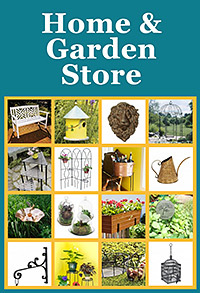 We carry a variety of wood, gas, and pellet models in our showroom. Drop by to see firsthand how a fireplace insert can improve the appearance and efficiency of your fireplace! 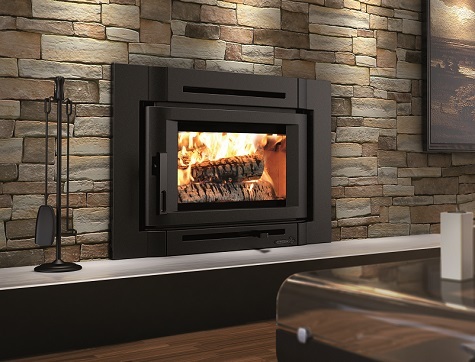 Our selection boasts some of the most innovative fireplace inserts on the market from Avalon, Lopi, Jotul, Fireplace Extrordinair and Enerzone. 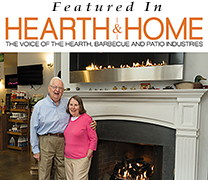 Known as Fairfield County’s friendliest hearth shop, our industry professionals are here to help you find the best fireplace insert for your needs & heating requirements. Gas fireplaces inserts are the most popular choice among homeowners because of their high-tech features and convenience. A gas fireplace insert not only converts your fireplace into a miniature furnace, it becomes a fully customizable focal point. Our selection of gas fireplaces offer a wide range of features to choose from including authentic looking faux logs, accent lighting, and remote or thermostat control. Talk to one of our team members to find out the unique ways you can customize your fireplace insert to make it just right for your home! A wood burning fireplace insert allows you to enjoy the aromatic crackle and pop of blazing logs while reducing your environmental impact. Designed with a re-burn system that creates more complete combustion these inserts emit less harmful gases and generate more heat. 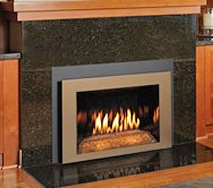 We carry some of the most innovative, clean burning wood burning fireplace inserts available with up to 80% efficiency. We offer EPA approved models that can continuously burn up to 12 hours. If you prefer to stick with the oldest, renewable resource, we have the right insert to convert your traditional fireplace into an effective heating source for your home. 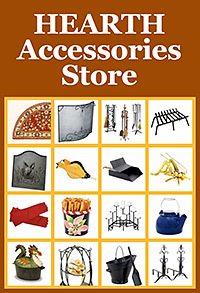 Find out more about wood burning fireplace inserts or come by and browse our selection. If you are torn between the pleasure of a wood burning fire and a desire for convenience, a pellet fireplace insert is an excellent choice. Pellet fireplace inserts are EPA approve and can surpass the efficiency of wood fireplace inserts because pellets are a more energy efficient fuel. Made from recycled wood chips, pieces and shavings that have been compressed and shaped, pellets are cost effective and environmentally friendly. Along with saving you the energy of chopping wood, pellets are ready to use when you buy them. The bags they come in are easy to store. 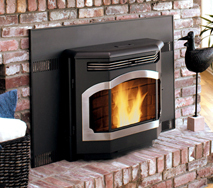 The greatest convenience of a pellet fireplace insert is that you don’t have to manually placing logs into the fire. The hopper (a storage container in the appliance filled with pellets) dispenses the fuel as it’s needed. You can control the heat output simply by setting the rate the pellets are dispensed. Some models even allow you to control the temperature with a thermostat. Find out more about pellet fireplace inserts or stop by our showroom to see for yourself how easy these heating appliances are too use!